Lady Finger / Bhendi fry recipe / Bhindi / Okra’s high levels of vitamin A, B & C, also zinc & calcium. okra is one of the favorite vegetables loved by almost everyone. 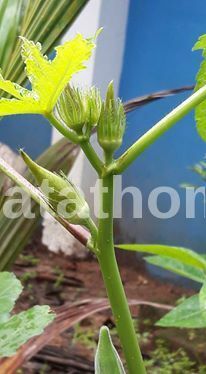 Okra also helps in controlling blood sugar and diabetes and in weight loss. Every year we grow Okra’s in our house garden. This home grown fresh okra’s is more tasty as compare to market one. In Maharashtra we make variety of okra dishes , भेंड्याचं लाळ , stuffed bhindi potato- masala bhendi , crispy bhendi and so on. My daughter love to little crunchy plain okra stir fry .it’s easy and tasty with phulka , chapathi or as side dish with rice. Wash and Cut Okra length wise. Heat a Pan , add 1 tbsp oil and shallow fry the Okra 3 min with medium- high flame. then same as your recipe. This is fixed step while u making okra recipe. its remove sticky and moisture into the okra. Heat oil in a pan add nigella seeds and green chillies and temper. Add the onion chopped and saute till it become golden brown. Cover it and keep stirring occasionally. Finally add sugar and mix. Serve it with rice and daal, chapati.